Your smile impacts your life in ways you may not realize. Smile studies have shown that smiling elevates your mood and well-being and actually produces more pleasure in the brain than chocolate. A smile can make you look thinner, younger, and of course, more welcoming. So, when you avoid smiling because you’re embarrassed by your teeth, you’re doing yourself a disservice. Many Americans have braces when they’re younger to ensure a straight smile, but without a nightly retainer, your teeth can migrate again, giving you crooked, overcrowded, or gapped teeth. Additionally, many adults and teens worry about the unsightly metal involved with traditional braces. Invisalign® Clear Braces are a great way to straighten your teeth in a discreet way. These removable braces are customized for your teeth and may involve tooth-colored attachments to keep them in place and promote tooth movement. They’re worn 20-22 hours a day. Orthodontics are one way to address tooth gaps, but if you don’t want lengthy treatments with braces or Invisalign®, there are other ways to treat gapped teeth. Porcelain veneers are one of the most common choices for this issue. This cosmetic dentistry option involves thin, porcelain shells that are placed over your existing teeth to solve one or more aesthetic problems including gaps and chips. The procedure itself requires minimal tooth reduction to make room for the veneers. Another, less invasive option, is Lumineers® which are thinner than porcelain veneers and don’t require enamel shaving. Cosmetic bonding can also address tooth gaps. Gum treatments can be for medical reasons or cosmetic concerns. Some men and women have an overly-gummy smile where their gums show excessively when they talk and smile. Gum recontouring can even out the gums. Alternately, gum disease impacts your oral health significantly and causes gum recession that creates an unsightly smile as well. Gum disease is particularly important to seek gum treatment because if left unchecked, your gums will inflame, bleed, and pull away from your teeth, creating a breeding ground for bacteria to seep into your bloodstream and eventually leads to tooth loss. Periodontal treatments can often reverse the beginning stages of gum disease. Metal fillings, also known as amalgam fillings or silver fillings, were commonly used to address tooth decay in the past but are not used as much in dentistry these days. In fact, many adults who had several silver fillings when they were younger come in to switch their metal fillings out with tooth-colored fillings made of composite resin. Your smile will change completely with this simple switch. While most people who have amalgam fillings have them on teeth that don’t typically show when you smile, these unsightly fillings still show when you speak and eat. The composite resin used for white fillings is also used for cosmetic bonding to address misshapen teeth, gaps, and chips. Teeth whitening is a common cosmetic dentistry treatment. Tooth discoloration can develop due to lifestyle habits such as smoking and drinking red wine or darkly-colored drinks, but it can also be caused by taking certain medications and be dictated by your genetics. Teeth whitening treatments can effectively whiten your teeth and give you a brighter smile. You may be tempted to buy over-the-counter (OTC) whitening strips, trays, and toothpastes, but these options come with several pitfalls. Toothpaste doesn’t stay in contact with your teeth long enough to make a significant difference and often contains weaker whitening agents. OTC strips and trays can leave you with uneven results and cause gum tissue irritation and tooth sensitivity if the whitening agents are too strong. At Bromley Park Dental in Brighton, we offer at-home teeth whitening kits so you can brighten your smile at your leisure in the comfort of your own home. These trays are customized to fit your teeth and carry fewer risks for sensitive teeth and gum issues. Replacing missing teeth is essential to your oral health and improves your overall well-being as well. Over time, missing teeth cause bone recession because of the lack of pressure and structure from the tooth. Your teeth will quickly begin to migrate, and you could lose up to 25 percent of your jaw bone within the first year alone. That affects your facial shape and puts you at risk of losing more teeth. Therefore, there are health and cosmetic benefits to replacing your lost tooth or multiple missing teeth. Dental implants are typically considered the best choice because the titanium post takes the place of your missing tooth root and the dental crown affixed to it looks, acts, and feels like your natural teeth. If you’re missing several teeth, implant-supported dentures or “All-on-Four Dental Implants” can restore your oral health and smile. Cosmetic dentistry can accomplish wonderful things for your smile and mitigate many common problems discussed above. 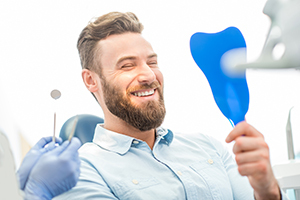 If you’re interested in improving the appearance of your teeth and gums, please contact our cosmetic dentist in Brighton, Colorado today at (303) 558-6537 to schedule your appointment. Bromley Park Dental provides general and cosmetic dentistry to patients in surrounding areas of Northern Colorado including Thornton, Commerce City, and Fort Lupton.